Welcome to the launch of European Football Weekends World Cup 2010 coverage. Woof! Wooosh! *explosion of fireworks and tickertape* And relax. Actually, don't relax just yet because guess who we've jumped into bed with to bring you a World Cup Tour Diary from throughout the first weeks of the greatest show on earth. 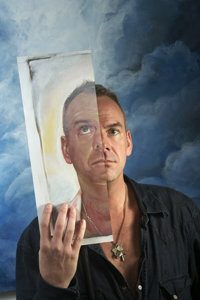 Only Fatboy Slim - no introduction necessary. Get the fireworks back out - Showbiz Ed. As well as watching six games, Norm will be following up his good work in the Coaching for Hope scheme. this is an innovative scheme in which FA football coaches are sent out to Africa to teach both football and raise awareness of HIV. They replace jelly shoes with trainers and take with them a huge number of football shirts. Brighton and Hove Albion, QPR, Everton and Hull City and the FA are involved. Norm has become the semi-official DJ for the England team having taken up similar duties at previous World Cups and European Championships. So pop back now and again as we'll be bringing that diary as well as a few other articles written from EFW Towers back in Blighty. Hold onto your hats, this could and should be quite a ride. 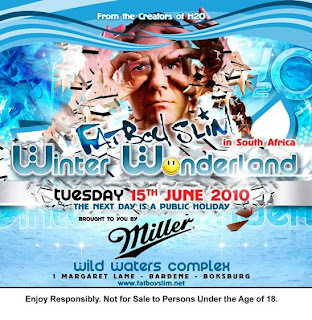 For ticket and other details see the Fatboy Slim Official and MySpace sites. We have tickets to the FBS concert in Cape Town straight after the Algeria match. Should be a cracking day, a few hours in the V&A waterfront, followed by the match, followed by the gig!